45 Then said David to the Philistine, Thou comest to me with a sword, and with a spear, and with a shield: but I come to thee in the name of the LORD of hosts, the God of the armies of Israel, whom thou hast defied. 46 This day will the LORD deliver thee into mine hand; and I will smite thee, and take thine head from thee; and I will give the carcasses of the host of the Philistines this day unto the fowls of the air, and to the wild beasts of the earth; that all the earth may know that there is a God in Israel. 47 And all this assembly shall know that the LORD saveth not with sword and spear: for the battle is the LORD's, and he will give you into our hands. 48 And it came to pass, when the Philistine arose, and came, and drew nigh to meet David, that David hastened, and ran toward the army to meet the Philistine. 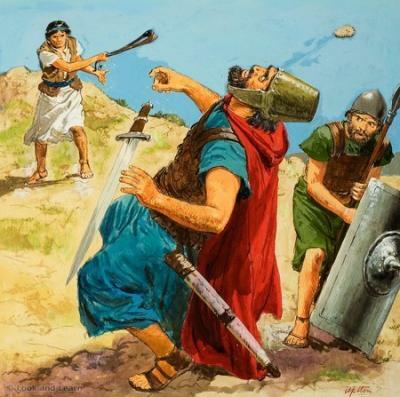 49 And David put his hand in his bag, and took thence a stone, and slang it, and smote the Philistine in his forehead, that the stone sunk into his forehead; and he fell upon his face to the earth. "" The Authors of the books of Samuel are thought to be Samuel, Gad, and Nathan. This quote is inspirational for a variety of reasons. Though David's inspiration for fighting Goliath is depicted as being highly metaphysical, the fact remains that the Philistines were harassing and slaying his friends and comrades. David was probably afraid to fight this larger more well armed man, but he found the courage to challenge him. He fought for his people, putting himself at great personal peril, but he emerged triumphant. It is amazing what a principled, determined, and courageous people can do when faced with an invading, oppressive force. We cannot be afraid to stand up to giants when our cause is just. Just like Goliath, it is often the case that the invaders are paper tigers. The world is now full of Goliaths, but like David we can find the courage to face them, and fight for our people.